Cure everything, start the day right, and it tastes good too. Juice the apple, lemon and ginger. 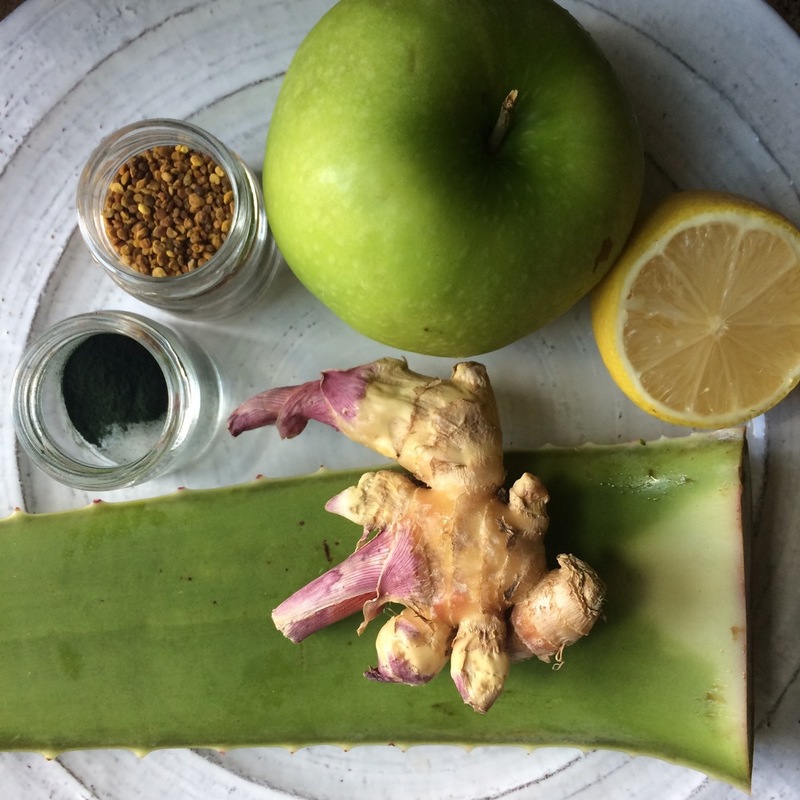 Blend(er) with the algae, bee pollen and aloe. Algae: Blue-green algae have a high protein, iron, and mineral content. Blue-green algae are known for their potential effects on the immune system, swelling (inflammation), and viral infections. Aloe: It’s great for your guts – stomach onward. Probiotics love it and it supports detoxification by binding to bile salts and removing bad stuff. Buy aloe leaf whole, remove the green and blend into smoothies, or get the juice. Lemon: Alkalizing: helping to restore balance to the body’s pH. Rich in vitamin C. Liver stimulant. Antibacterial. Contain 22 anti-cancer compounds. And, according to The Reams Biological Ionization Theory, the lemon is the ONLY food in the world that is anionic (an ion with a negative charge). All other foods are cationic (the ion has a positive charge.) This makes it extremely useful to health as it is the interaction between anions and cations that ultimately provides all cell energy.